Do you want your MTV – specifically information about musicians and songs? 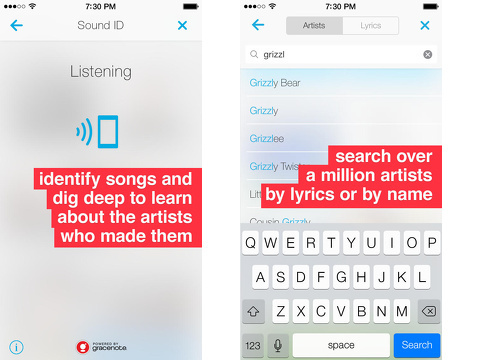 The MTV Artists iPhone, iPod Touch, and iPad app searches for your favorite musicians by name, lyrics, and a Sound ID feature that identifies a musician and song by playing the song into your iPhone. The MTV Artists iPhone app is a free download from the iTunes App Store, but it is supported by ads at the bottom of the screen and prior to videos. The home screen is a nicely-organized social feed. There is a menu bar at the top with one-touch access to the main tools – search and Sound ID. Just below, you can filter the artists between trending, collections, and history. The rest of the screen is the feed with thumbnail photos and names of the artists. The thumbnail photos do not have a consistent shape, so there is added visual dimension to the feed. Each musician and band has an interface devoted to its news, videos, bios, tour dates, photos, interviews, and social footprint. The quantity of information contained is vast, and the interface is impressively concise and well-organized. Each category of information is listed vertically, and each category expands horizontally with all of the information. For gesture controls, you swipe vertically to check out the information shared like music, photos, and interviews, and then you swipe horizontally to see more. The interface not only encourages you to explore MTV’s content for each musician, but also it provides you quick access to engage with the musician. You can like on Facebook and Twitter with a touch. You can purchase music from the iTunes Music Store and tickets for an upcoming concert. 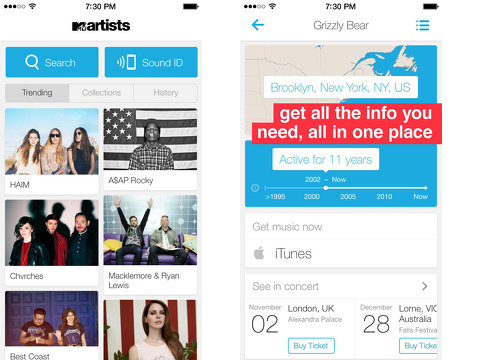 The MTV Artists iPhone app also incorporates multiple tools to introduce you to new musicians. On each musician’s feed, comparable musicians and bands are suggested. With one touch, you move to that musician’s feed. The collections sort icon accessed on the home screen is also a cool way to find new musicians and bands. MTV and VH1 shows have a custom feed, and selected musicians curate their own feeds. The Sound ID tool functions well and enhances the MTV Artists iPhone app. You simply tap the Sound ID icon in the top menu bar and allow access to your microphone. The artist and name of song quickly pops up. The rest of the musician’s feed may be accessed with vertical scrolling. The search feature for the song lyrics is surprisingly intuitive. I put in lyrics for a song, but the order was incorrect. The MTV Artists iPhone app still identified the correct song. The MTV Artists iPhone, iPod Touch, and iPad app is superbly organized, has great tools, and is filled with solid content – thankfully not a stream of crappy YouTube videos shot by a screaming and rapidly gyrating concert attendee. AppSafari review of MTV Artists was written by Jenni Ward on November 11th, 2013 and categorized under App Store, Free, Fun, Music, Social. Page viewed 3826 times, 1 so far today. Need help on using these apps? Please read the Help Page.